Double Magic Classic Slot Guide & Review - Casino Answers! 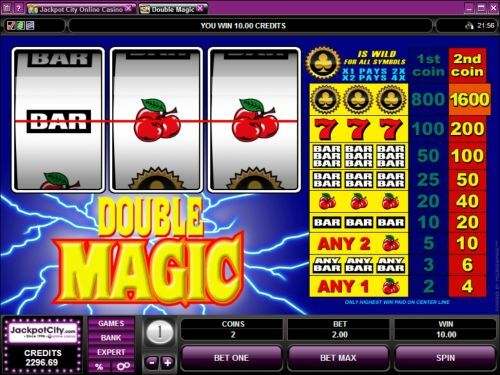 Double Magic is a 3-reel, 1-line classic slot machine developed by Microgaming, featuring a wild symbol and multipliers. You can play the Double Magic classic slot machine at Bovada. Coin sizes on the Double Magic slot machine are $0.25, $0.50, $1, $2, $5, $10, $20 and $25. You can bet 1 or 2 coins per spin. There is no added value in maximum bet spins. The lowest total bet you can make on the Double Magic slot game is $0.25 per spin with the highest total bet being $50 per spin. That is an excellent betting range for a Microgaming classic slot machine, suitable for all types of players – casual players and high rollers, as well as everything inbetween. To play both coins on the Double Magic online slot, use the “Bet Max” button. For all other bets, select your bet and hit the “Spin” button. The highest paying symbol on the Double Magic slot game is the Club symbol. If you make a maximum bet on Double Magic and hit 3 of a Kind of this symbol on the single payline, you will win the 1600 coin top jackpot. The Club symbol is wild and will substitute for all other symbols in the slot game. The Club symbol will also multiply your winnings when it appears in a winning combination – 2X for 1 symbol and 4X for 2 symbols. Use this symbol to win big on the Double Magic reel slot machine at Bovada. There are 9 winning combinations on the Double Magic classic slot machine. The complete payout schedule is as follows (1/2 coin payouts in parenthesis): 1 Cherry symbol (2/4), any 3 Bar symbols (3/6), any 2 Cherry symbols (5/10), 3 Single Bar symbols (10/20), 3 Cherry symbols (20/40), 3 Double Bar symbols (25/50), 3 Double Bar symbols (50/100), 3 Red Seven symbols (100/200) and 3 Club symbols (800/1600). After hitting the “Expert” button, you will gain access to Double Magic’s autoplay mode. Here you will have a multitude of options, including playing up to 500 autoplay spins and setting the number of seconds between spins. You can also set stop settings, including stop once all spins are complete, stop when the jackpot is won, stop if a win exceeds or equals your desired amount, stop on any win and stop if your credits increase enough or decrease too much. You can stop autoplay at any time. Double Magic doesn’t provide much in the way of pizzazz, but regardless it is a reel slot machine that you can play and win cash on. That seems to be the point of the Double Magic slot machine more than anything else. To play it, you can sign up and make a deposit at Bovada. Are there any other slot games like Double Magic? Yes, you can also play the Triple Magic slot machine as well as a MegaSpin version of the Double Magic slot. Can USA players play the Double Magic online slot game for real money? While American slots players cannot play the Double Magic online slot machine for real money, they can play some classic slots with lots of multipliers at Vegas Tech casinos such as Bovada. These casino games include the Double Gold Slot Machine, Triple Gold Slot Machine and the Triple Triple Gold Slot Machine. Can I play a free Flash game of the Double Magic classic slot? The Double Magic slot machine should be located on page 18 of the Instant Play casinos at Bovada. You can play for fun or for real money. If you experience any difficulties with the Flash casino software, make sure you have the latest version of Adobe Flash Player installed on your computer.